The world’s most anticipated newborn has yet to arrive, but food companies are already clamoring to feed it. 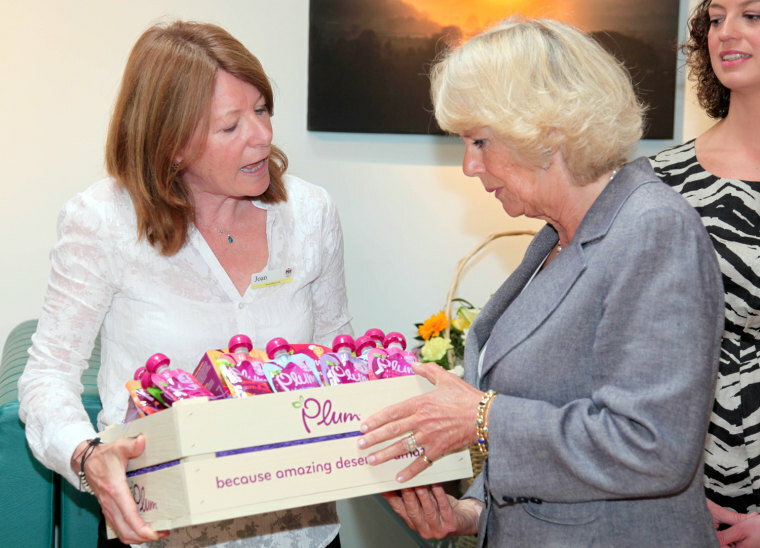 Prince William and Duchess Kate's kid has already received a crate full of packets of baby food from organic brand Plum, accepted graciously by Camilla, Duchess of Cornwall last week for her soon-to-be-born grandchild. The company was “delighted” to gift the baby with some grub, CEO Scott Wotherspoon told TODAY.com, and for good reason. Hoping the "Kate effect" will transfer to her baby's life -- selling out every toy, snack, and onesie he or she touches -- baby food producers are keen to have their brands associated with the royal infant. Though Plum appears to have a leg up on other baby food brands to become the first pre-packaged puree to enter a UK heir’s mouth, the baby won't be able to eat solid food for several months. And when it does, will packaged food be a staple of its royal diet? "I’ve certainly never seen packaged food with any of the royal babies,” Darren McGrady, former chef to Queen Elizabeth, Princess Diana and Princes William and Harry, told TODAY.com. “Why would they buy packaged food when the queen has 20 personal chefs?” asked McGrady, who worked at Buckingham Palace from 1982 to 1993, and at Kensington Palace from 1993 until Princess Diana’s death in 1997. Known internationally as “The Royal Chef,” he now lives in Texas and has cooked for five U.S. presidents. Over his 15 years with the Windsors, McGrady pureed the princes’ first meals of steamed apples and pears from the queen’s Sandringham country retreat. The purees had to be sieved twice to be absolutely sure no lumps remained, he said, adding that he thought the royal baby would have a similar diet when he or she begins eating solids. “As they got older, you’d have one chef in the kitchen doing the chicken, one doing the veg, and then it would all be blended together; it was a major operation cooking for them,” he said. One of William’s favorite desserts, banana flan, evolved from their infant meals of pureed banana and custard. Other hits of McGrady’s were chocolate biscuit cake, which the prince chose for his Groom’s cake, and peanut butter and jelly muffins, which the boys requested after trying them at Disney World. The princes’ nanny made sure the boys ate their broccoli and Brussels sprouts, but their palates were like those of any British child, the chef said. “If it was left to the boys, it would be cheeseburgers, pizza, chicken nuggets, and loaded jacket potatoes,” McGrady said. Meals with the queen were always formal, he said, but Princess Diana would give the princes bananas and yogurt in the kitchen, let them eat meals on trays in front of the TV, and once cancelled their planned dinner to take them to McDonalds – because they wanted the Happy Meal toys. Like her late mother-in-law, Duchess Kate is seen as a “people’s princess” who would like to raise her baby in as normal a way as possible. However, given that media outlets from around the world are already camped outside London’s St. Mary’s hospital, where Kate will give birth, and all of the history and protocol that go along with raising the heir to the throne, Kate is in for a difficult balancing act. “The thing about royal babies is that as children everyone has tried to bring them up as normal as possible, but that idea of normal changes over the years,” said royal biographer and historian Hugo Vickers. Back in the 19th century, Queen Victoria employed numerous wet nurses to breastfeed her nine children as was common practice among the upper classes at that time. Born in 1926, Queen Elizabeth was not allowed to go to school as it was then deemed improper for a princess to mix with commoners. As palace life evolved, Queen Elizabeth reportedly breastfed Prince Charles, but he attended nursery in Buckingham Palace with children brought in to play with him. In the 1980s, Prince William was breastfed and went outside to a local nursery. A chef for the baby? When they married in April 2011, the queen promised the couple a two-year grace period from public life. However, those two years are now up. “When you marry into the royal family you have royal duties and commitments; they will have to have a chef at home preparing everything,” said royal chef McGrady. “I’m sure Kate will have input into what dishes the baby will have, but the nanny will have the ultimate say,” he said. The chef predicted that the prince or princess will be raised on traditional British foods like he made for the princes, such as cottage pie, roast chicken and bread and butter pudding. Prince Charles is a major proponent of organic farming, so the baby will likely have organic produce, with some of it coming from the gardens on the royal estates, he said. Whatever the royal baby eats, others will be sure to follow. “It’s not just the clothing and name that will trend; people will think that Kate and the nannies are bound to have it right, so they will want to have the best for their babies too,” the chef said.